Juvenile Huntington's disease is an uncommon form of Huntington's disease that can be devastating for those suffering from it. Only somewhere between five and ten percent of all Huntington's disease cases fall into this category. As you may expect by the name, the onset of symptoms for this condition occurs when the patient is twenty years old or younger. This progressive disease will cause brain cells to break down in specific parts of your brain. Living with this condition is very difficult because it will negatively impact your way of life. People suffering from this disease wind up losing some of their intellectual capabilities, and they may also have uncontrollable movements. It can cause emotional problems as well, and outbursts are sometimes symptoms of the disease. Once symptoms begin to show themselves, the disease will begin to progress rapidly. It's easy to be overcome with anxiety and depression at the thought of suffering from a condition like this. Even still, many people who are suffering from this disease carry on with an amazing amount of grace and dignity. This is not a condition that can be cured at present, but those suffering from it and their families have to do their best to maintain hope. Knowing that there isn't an available cure makes it difficult to cope, and you may want to consider reaching out to professional therapists to receive counseling. If you or a loved one has been diagnosed with juvenile Huntington's disease, then you may have difficulties accepting the prognosis. Being that it is such a rare condition, it's possible that you may not know much about it. This article can help you to learn about the disease and to understand why it is so devastating. Read on to learn more about every aspect of this disease, treatment options, and much more. There are many symptoms associated with juvenile Huntington's disease. Typical symptoms include difficulties thinking, loss of coordination, severe emotional problems, and drastic personality changes. The fact that this disease alters your brain cells causes it to change people in many ways. Breaking down the cells in your brain can alter overall intellectual capabilities and reactions to certain situations. As mentioned briefly above, the intellectual capabilities of those suffering from this disease will be severely hampered over time. It can become difficult to think, and issues that once would have been simple will now be quite taxing. This is combined with physical symptoms to cause patients severe emotional distress. For young people who are still in school, seeing their academic performance suffer so drastically in a short period can be devastating. There are several other symptoms that people with Huntington's disease will experience as well. These symptoms include muscle twitches, tremors, stiff leg muscles, difficulties swallowing, slurred speech, and much more. People with this condition can have extreme difficulties with everyday activities, and this can bring about more feelings of frustration. Coping with constantly worsening physical and mental symptoms is certainly not easy. The symptoms mentioned above are also symptoms of adult-onset Huntington's disease, but the biggest difference between juvenile Huntington's disease and the adult-onset version is that the progression of the disease is much faster for juveniles. Those who are diagnosed with juvenile Huntington's disease often only live between ten and fifteen years after contracting the disease. Being so young and knowing that your life is going to be cut short can be very difficult to come to terms with on both an emotional and mental level. It should also be noted that many people who have juvenile Huntington's disease will have seizures. This isn't common in adult-onset Huntington's disease but is seen fairly often in juvenile cases. Those who have juvenile Huntington's disease at an extremely young age are even more likely to have regular seizures. Chorea is common for those with adult-onset Huntington's disease but is typically far milder in juvenile cases and sometimes may not even be present. Can This Disease Be Passed On Genetically? 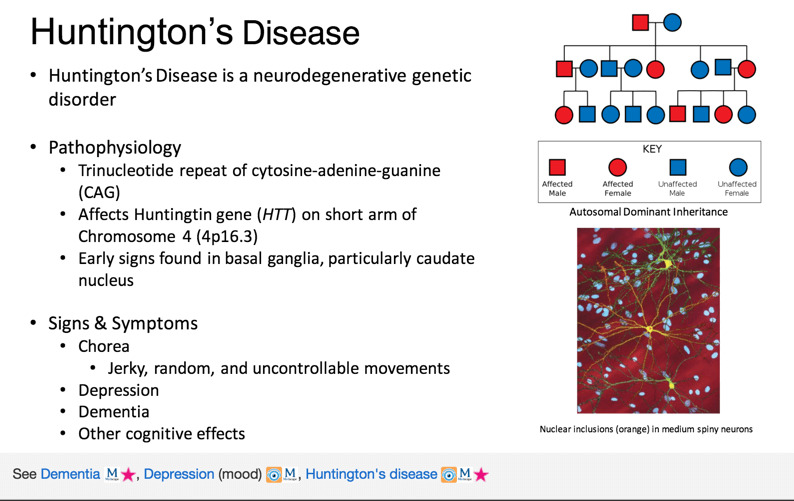 Huntington's disease is something that can be passed on genetically. While it is a rare condition, carriers of the disease have the possibility of passing it to the next generation. To put it simply, there is an altered gene present in carriers of this disease and it can be passed down to the carriers' children. 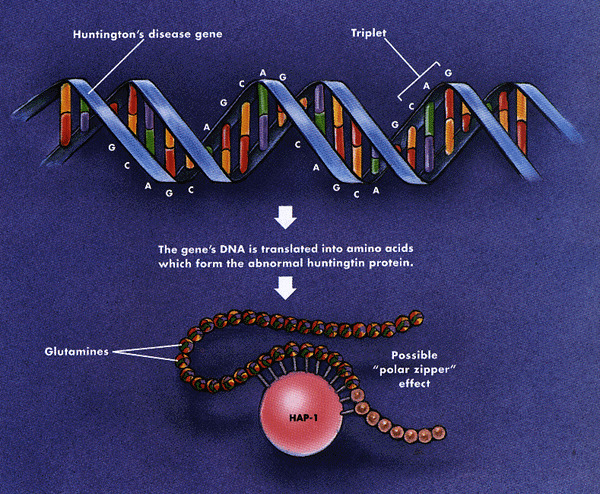 Through being passed down for generations, the size of this altered gene often increases and then leads to the early onset of Huntington's disease symptoms. The father is usually responsible for passing down the gene responsible for Huntington's disease; mothers can also pass down this gene, although it is less common. Many people who are aware they are carriers for this disease will avoid having children to prevent the disease from continuing in their bloodline. It can be a difficult decision to make knowing that you are a carrier for this gene. Sometimes the earliest symptoms of juvenile Huntington's disease that will be noticed are severe behavioral problems. Teenagers may lash out and have trouble concentrating at school. Often, people don't think much of this because hormones can make living life as a teenager tumultuous under normal circumstances. Regardless, if behavioral problems become severe and if a teenager's ability to think is severely compromised, it will usually lead to their parents seeking medical advice. The disease is diagnosed by having the patient's symptoms evaluated by a doctor. Typically, a pediatric neurologist will be the one doing the evaluation. Many factors are taken into consideration, including family medical history, genetic testing, and the severity of the symptoms. Being that juvenile Huntington's disease is a rare condition, the neurologist will rule out all other possibilities before determining that this disease is the cause of a patient's problems. Genetic testing is extremely important when it comes to diagnosing juvenile Huntington's disease. Sometimes people will have no clue that their family has any history with this condition. It is possible that members of your family may have passed away before they could exhibit symptoms of this disease. This means that you could be a carrier for Huntington's disease without having any knowledge of it has impacted your family. The genetic tests are very reliable, and they will be able to definitively determine whether or not juvenile Huntington's disease is the cause of a patient's symptoms. This can be a taxing time for a family as having questions about why things are happening can be very frightening. If you work together with the neurologist, it will be possible to make a determination as expediently as possible. This way you can focus on acknowledging what is happening no matter what that may be. 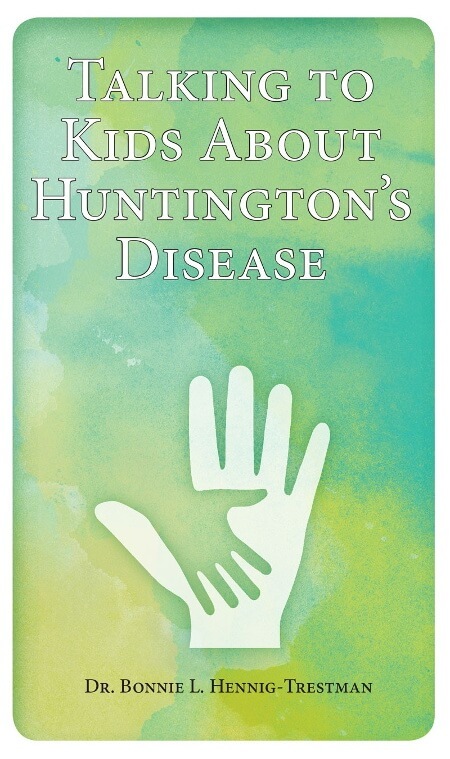 The cause of juvenile Huntington's disease is an altered gene that is present in your body. 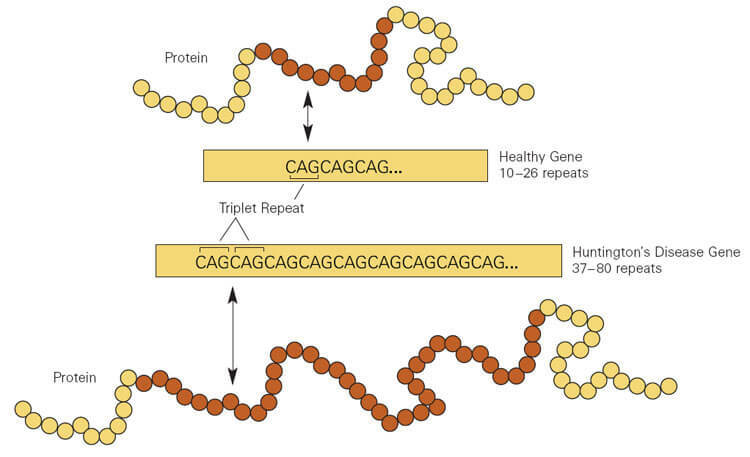 This gene is known as the HTT gene. Under normal circumstances, this gene is supposed to help your body product protein that is crucial for normal brain functions. The protein itself is known as huntingtin, and this is where the name for the condition was derived. People who have Huntington's disease have HTT genes that do not function properly. They do not create protein correctly, and the nerve cells in your brain begin to die out due to being deprived of the necessary protein. It is a very progressive disease that will continually worsen as those suffering from it continue to age. The lifespan of people who have juvenile Huntington's disease is traditionally very short. There is no cure for this disease at the time of writing. Doctors and scientists continue to examine the condition and are considering new possibilities for treatments. The best thing that doctors can do for their patients right now is to help them to live more comfortably. Doctors work to try to help their patients cope with these symptoms by giving them access to resources that can be helpful. Most people who have Huntington's disease are not able to work due to the condition. Those who are still in school will need to have a specially designed education program that is suited to their needs. It will be challenging, but many young people do their best to live their lives despite having this disease. Doctors will work diligently to ensure that patients are comfortable and will address the physical symptoms that are associated with this disease. One of the most important treatments for patients to seek out is therapy to help them cope with the situation. Emotional outbursts and behavioral issues are common symptoms of juvenile Huntington's disease, but it's also just difficult to know your life is going to be a short one in all likelihood. Therapists can give people suffering from this condition someone to talk to, and they can allow patients to feel better about continuing to live their lives in the face of this disease. Anything that can give someone strength when faced with a diagnosis like this is very helpful. You can seek out professional help that will allow you to cope with this situation a little easier. If you don't want to have to leave your house to attend counseling or therapy sessions, then you may want to consider making use of online resources. You can sign up at https://www.betterhelp.com/start/ today to get professional assistance. Dealing with a terminal illness can be traumatic, but there are people out there who care about you and wish to help. Having someone to talk to about your frustrations and your daily struggles can help to alleviate your burden. This disease does not have a cure, but that doesn't mean that you have to give up. If you feel like therapy and counseling could help you to manage this condition better, then it is worthwhile to reach out. You will be able to get help and will feel much better about life in general. Simply knowing that you are not alone can make a difference in your life. This type of therapy and support can be very beneficial for the parents of those who have juvenile Huntington's disease as well. Seeing your child go through such hardships can break your heart, but you need to be strong to help them live their life as best they can. Talking with a professional about these struggles can help you to stay positive and remain focused. Just know that assistance is there if you want to look into it. How you decide to cope and live with this condition is ultimately going to be up to you. It can be scary, and it is a terrible situation to be in. The remarkable strength that many have shown when facing down this disease is something to be commended. You get to choose how you live your life and others will be happy to help you if you want to share the burden.